There are a number of factors which influence a prints price. One of those being the nature of the signature on the print. With Toshi Yoshida there are three variants of his ‘western style’ signature found on nearly all his prints which is the topic for this article. There is a fourth variant of his signature, that being pencil signed in Japanese kanji which appears on his prints from the 1980’s (eg. Birds of the Seasons and the Friendly Garden triptych) produced for the Franklin Mint. Posthumous Prints: Those prints made after Toshi Yoshida’s death by the Yoshida family/studio. The artists signature is applied to the print with a stamp. These are generally the cheapest prints to buy but the quality is still very high and you are still getting a hand-made product. Raised Seal Prints: These are prints made towards the end of his lifetime when still supervising print production at the studio but was too weak to hand sign the prints. As with posthumous prints the artists signature is applied to the print and a stamped embossed seal is also added to the print (typically in the bottom right margin). Price-wise these prints tend to sit between the posthumous and hand-signed print prices. Pencil Signed Prints: These are lifetime prints hand signed in pencil by the artist himself and tend to be the most expensive. When buying a print it’s important to know (among other factors) whether the print is pencil signed, a raised seal edition or a posthumous edition. Signature example – Posthumous print. The easiest way to spot a posthumous print is by viewing the prints verso. If there are Japanese kanji characters in the verso margin then it’s a posthumous print. You don’t always get a chance to see a prints verso (as it may be framed or you may be buying/bidding online) but you can also tell by checking the artists signature on the print. (a) a gap between the ‘i’ and the ‘d’. (b) the ‘d’ sits higher that the ‘i’ and the ‘a’. (c) the loop of the ‘a’ is closed. It’s not guaranteed, but if the above tests are true then it’s very likely to be a stamped signature print. Signature example – Raised seal print. As can be seen above the signature matches the stamped/posthumous one and there is an embossed seal to the right of the signature so this is a lifetime raised seal print. Signature example – Pencil signed print. Pencil signed prints do not have stamped kanji characters on the verso and do not have an embossed image beside the signature. Often the loop of the ‘a’ is open. The signature will not match those on the posthumous prints however there is no guarantee that this is always the case. I have seen one or two that are close but I suspect that the carving of the signature to make the stamp probably made it unique. If I am looking at a Toshi Yoshida “Bamboo of the Friendly Garden” and it has Franklin int stamp on the back – is that necessarily mean it is original Kanji signature. It is framed and I cannot look at the verso. It says Franklin Mint 1980 on the label on the back. What’s it worth unframed. I believe that the woodblock prints in the Toshi Yoshida Friendly Garden series were only produced as lifetime print/s. Pricing’s really difficult to give, for example, I’ve seen the set of three prints (framed) for anywhere from $247USD (on ebay) to around $1600USD (web gallery). Generally a collector would want the print framed in the original teak frame. 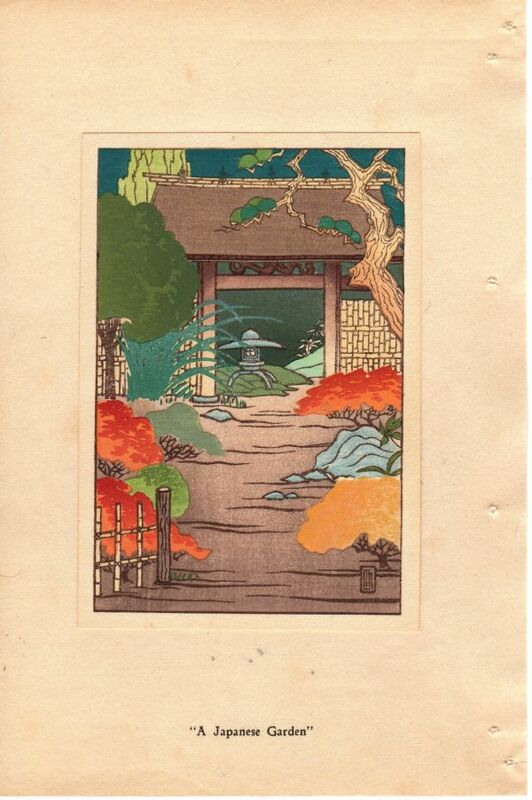 An original framed Friendly Garden Pine woodblock print sold recently on ebay sold for $300USD earlier this month. I can’t recall seeing an unframed print from the series being sold so have no guide to what an unframed print would be worth. The Japaneese kanji signature – would that draw the same higher price as the pencil signed? I have all 3 Friendly Garden prints collecting dust and thought I’d sell them. The Friendly Garden series from 1980 was a lifetime edition so it’s comparable to the pencil signed prints. The only lifetime prints that are worth less than a pencil signed print are the raised seal edition prints which bear a stamped Toshi Yoshida signature and an embossed/raised seal and were produced whilst he was alive but to ill to hand sign prints. I have a Toshi Yoshida ‘Hummingbird and Fushia’ purchased approx. 1982 with pencil signature. Back of frame reads – Humming birds, self carved, self printed. I am looking to sell it. Would you be able to give me a rough valuation. I’m not a valuer so can’t give you a valuation. To have your woodblock print valued you’d need to contact a local auction house or appraiser/valuer. 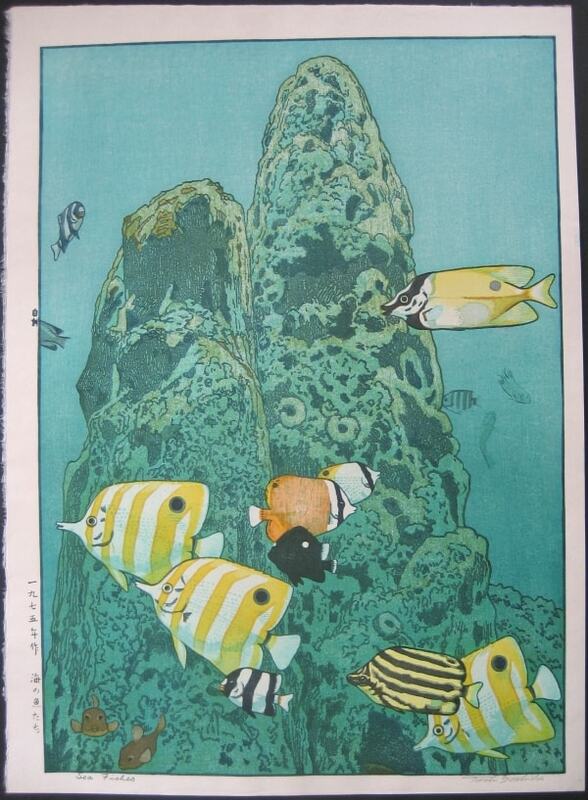 I can tell you however that the very few auction records I can see list this woodblock print selling at prices from $200USD (way to cheap!) to $500USD. The most recent one I saw – framed – was July last year for $256USD. An auction house or professional appraiser would have access to much more sales history data than I can see. The only copy of this woodlbock print I could find for sale after doing a quick search is $800USD and its been available for a very long time. Personally if I was selling my copy – never framed and in very good condition – on eBay I’d try setting my starting price at $350 hoping to get more, but you never know who’s out there to bid. I have a pencil signed in Japanese, framed in I think teakwood PINE TREE OF THE FRIENDLY GARDEN by TOSHI YOSHIDA. CIRCA 1980 FRANKLIN MINT. It has a small stain on right bottom corner on raw silk and I read I could clean it with mild soap and water. I am not a professional so would rather not touch it, due to wanting to sell it. Do you know of any places that buy this type of art in southern Calif. USA. Here’s a few websites to look at. I’m not familiar with their actual locations so you’ll need to view their about or contact pages. Ukiyoe Gallery tend to be the most frequent seller of prints in the Yoshida Friendly Garden series. Galleries that sell Toshi Yoshida works. 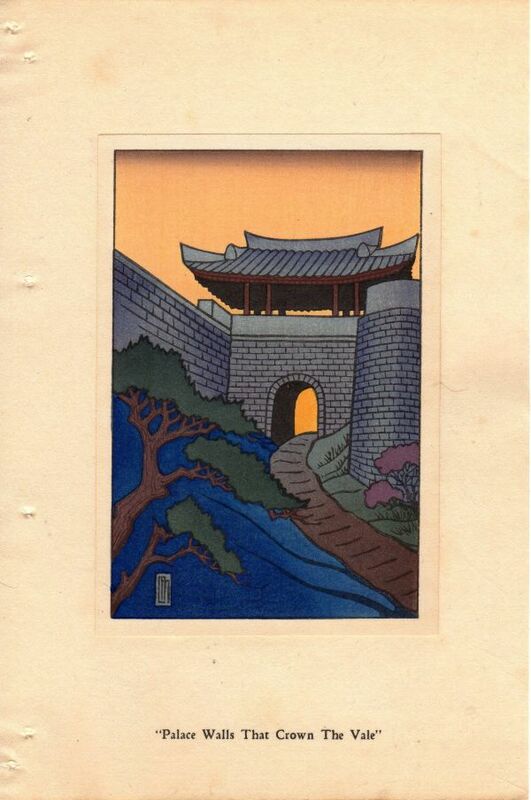 Auction sites for selling woodblock prints include. I have a toshi yoshida 1976 block print titled “running” from his series “one day in east Africa”. It is number 117/250 and is signed. It has Japanese characters on the left margin and has the date 1976 after the signature. Is this a reissue? Generally a posthumous Toshi Yoshida woodblock print would have a set of kanji characters printed on the back denoting the name of the printer – lifetime prints do not have that. 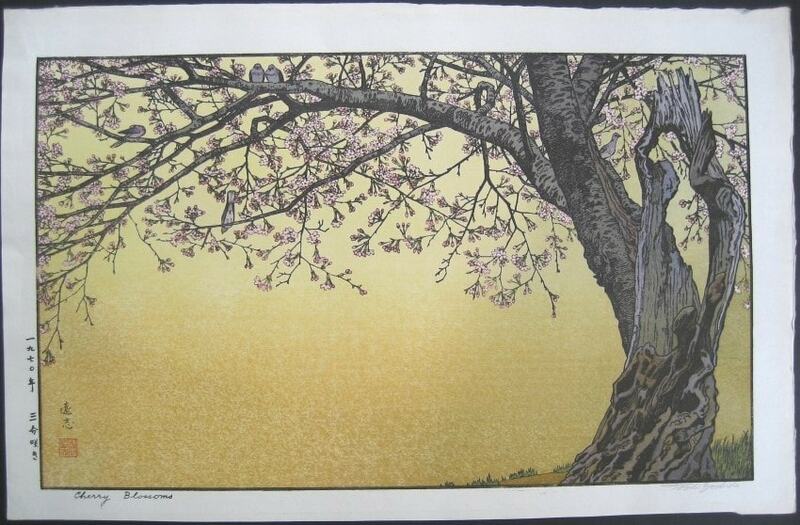 You can also match the signature on the woodblock print against the examples here https://www.japaneseartsgallery.com/2010/08/toshi-yoshida-signature-comparison/. If in doubt, please use the Contact Us page to send a large size image of the front and back of the print and I’ll be happy to take a look. I bought two signed Yoshida Toshi woodblock prints (Heirinji, Temple Bell and White Plum in the Farmyard) in 1985 while living in Yokosuka. They were purchased and framed by Kanda’s BOQ Gallery in Tokyo. His name is penciled in the left lower corner of both prints. There are konji characters down the right side of the prints. They look like his name (?) at the top of the vertical grouping of konji (same for both prints), and then possibly the name of the print (different for each print). Finally, there is a red chop on both prints, one on the lower right, and the other one the lower left. His signature was clearly done prior to his death since these have been in my possession since 1985. 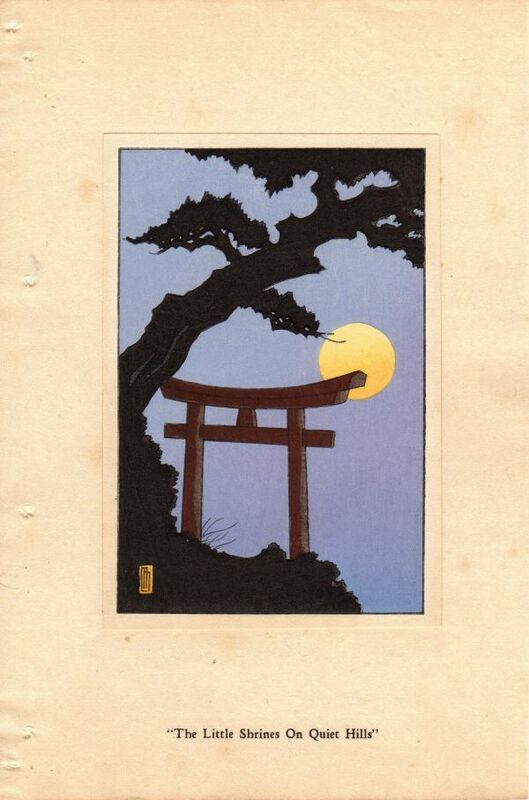 They are in excellent condition, in typical simple wooden Japanese wood frames. Can you please give me some idea what they may be worth? I would like to give them to my adult children. Thank you. I’m not an appraiser/valuer so if you need an ‘official’ valuation then you’ll need to seek out a licensed appraiser/valuer. Places like Floating World, Castle Fine Arts and F and R Fine Arts all offer appraisals. In terms of what I’ve seen in the auction market, they often sell in the $200-300 USD range. I sold my pencil signed copy of Heirinji, Temple Bell towards the lower end of that range recently. Floating World probably have the best and largest selection of Toshi Yoshida prints around and they typically set a retail price of $450 on oban sized prints (which yours are) which have no condition issues. Floating World have a copy of this very large print (at 16 x 47 inches) for retail sale at $6,500USD so that establishes the top end price for the print. I do note that they list it as being an edition of 150 where-as you advised 158? Given it’s size, the low edition produced and the fact it’s an attractive print all add to it’s value. I’m not an appraiser/valuer so can’t give valuations. I did take a quick look around but didn’t find any copies of this print in the (limited) auction information I have access to. The following sites offer print appraisals so you can try contacting them. Thank you very much for looking that up and for the links, Mike. Yes, you are correct that the run number is 150, not 158; my mistake. Another question, if I may. 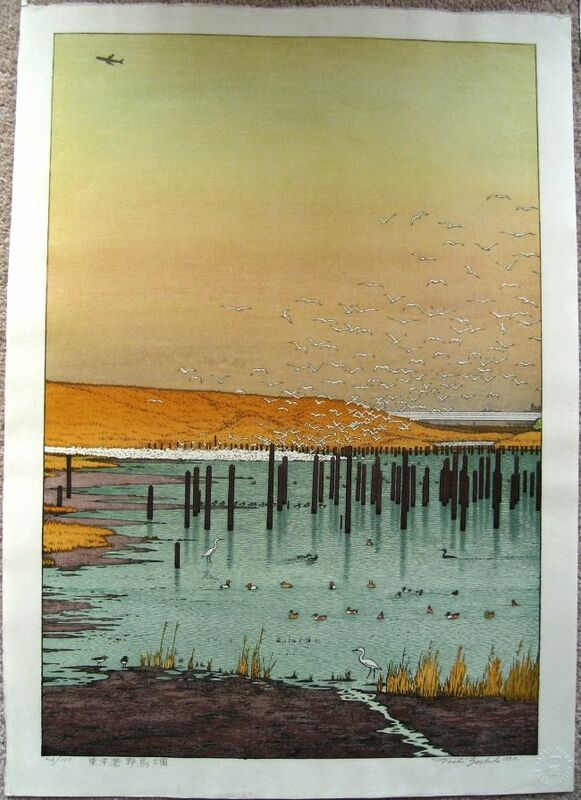 I recently bought a poorly framed woodblock titled “Reflect” by Tsukasa Yoshida at a thrift store. After finding images of it on line, I see that it was cut to fit in the frame, unfortunately. It appears that about 1/3 of the image was neatly cut from the left side, and the white margins were trimmed off the top and both sides as well. His pencil signature is complete on the bottom right, and one (or two) pencil kanji characters plus what looks like the numeral “3” appear on the bottom near the left side (which would probably be the middle on the uncut print). I’m assuming this print has little or no value since it has been cut, but I would appreciate your opinion on that. It is still beautiful, even without the left side. Thank you again for your advice. Copies of that print are currently for sale at a couple of galleries for $375 and $450. I think I’ve previously seen it on eBay for $200-300. Given the ‘missing’ third of the print selling it may be difficult. For a collector I’d say it has no value but at the right price someone might buy it to display framed on the wall rather than as a collectible. Framed prints are a tricky area. The mat board/s may conceal print issues such as trimmed margins, mat burn, foxing etc. I generally try to pay less for a framed print than an unframed one to factor in the unknown condition aspect. Some sellers will not provide images of a print unframed as (a) there’s a slight possibility they may damage the print in doing so and (b) if there’s a condition problem they weren’t previously aware of they may need to now review (a.k.a. lower) their asking price. So, for some sellers who sell as-is/no returns there’s probably a financial incentive to not know the condition of the print beyond what is visible. Could you tell by a photo if it is a pencil signature vs the others ones mentioned here? Yes, it’s usually possible to tell if the signature is pencil signed or not. Another way is to check the back of the print – if it has a series of kanji characters in the bottom left/right margin that it would a posthumous print.